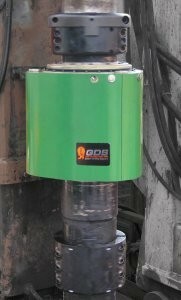 A new hydraulic IBOP (Internal Blowout Preventer) actuator from GDS (Global Drilling Support) International is the direct result of GDS’ many years of experience and knowledge gained from working with leading top drive brands. A unique design, this actuator can open or close the top drive, while the top drive is in rotation. This feature eliminates the mess often associated with other actuator models, which must stop rotating before opening or closing. The compact body of this actuator also allows ample room for the elevator links to pass by, and its simple design means fewer parts and seals to be maintained. Easily field installed, the GDS IBOP actuator is designed to fit any major brand top drive.